Since it has long been established that Russ and I are "foodie-hacks," and since there has been a precedent set for a "celebrity guest reviewer" to show up in a post or two, I decided it was high time we found someone respectable enough for the title of "full-fledged foodie" to co-score an item here on our illustrious blog. Not only the Director of Community at Consmr, she's also the co-founder of Philly's own Federal Donuts and a food writer for numerous publications even more impressive than this blog...please welcome Felicia D'Ambrosio! 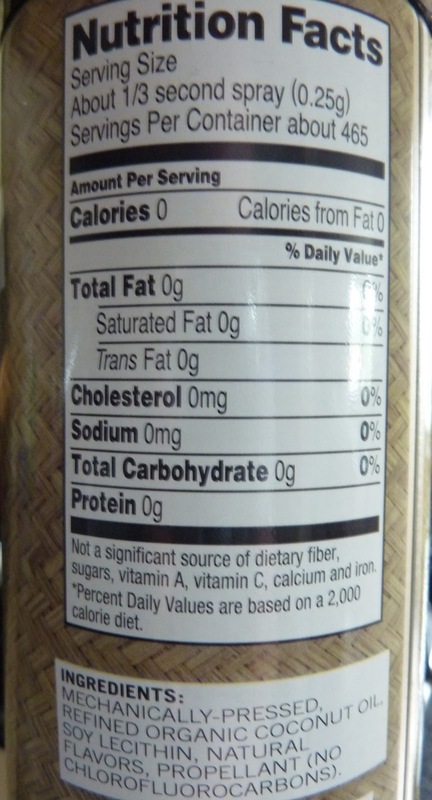 At her suggestion, we're taking a look at this coconut-based cooking oil from TJ's. It was cheap, a little under $3 at my local store. It has delicious-looking coconuts on the packaging that make the product look like it could quite possibly be used as an ice cream topping as well as a cooking spray. (I found out the hard way that it should NOT be used as an ice cream topping). But it does have a slight hint of coconut flavor if you ask me. Felicia found it to be "neutral in flavor," adding, "I haven't noticed much coconut in finished foods, since you are using so little in each spray." I think she was hinting that if I'm tasting any coconut, that I'm probably using too much. But in true foodie-hack fashion, I slathered the pan with a generous coating of coconut oil, and at least with the first item I made, a stir fry, I could have sworn I tasted just a hint of coconut. The can does mention that it's "mild flavored," and after squirting some directly into my mouth, I did confirm that there is a subtle hint of coconut there. Granted, it's so subtle that spraying the product into your mouth is not a particularly pleasant experience, and it follows that any normal amount of the oil should probably not be tasted in your finished food. When I baked these crab cakes in the oven, I no longer detected any coconut. But the taste of this product (or lack thereof) isn't the reason for using it. Felicia used it to make veggie burgers, steaks, and she raved about its non-stick properties in regards to baking. She recommends it for its "high heat tolerance on the grill and for baking as a healthier alternative to products like Pam." I did raise an eyebrow when I saw the words "propellant (no chlorofluorocarbons)" on the ingredients list. It's great to know the ozone's safe, but will we be safe? Apparently propellant is in most aerosol-style cooking sprays, so it's probably something that can't easily be avoided. But anyway, we were both impressed that actual coconut oil could be used as a replacement for traditional kitchen cooking sprays. Again, Trader Joe's appears to be ahead of the curve in terms of culinary innovation. There are other "health food" brands that make similar products, but they tend to be significantly more expensive than $3 a can. 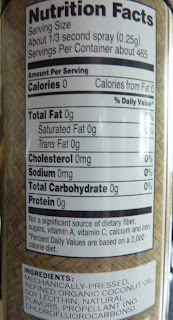 Felicia asks, "How long until big food companies pick up on this coconut cooking spray idea?" They're too busy finding new ways to kill us slowly, Felicia. Ms. D'Ambrosio gives this product 5 out of 5 stars. I'll give it 4.5, docking half a star because part of me still wants it to taste more like coconut.